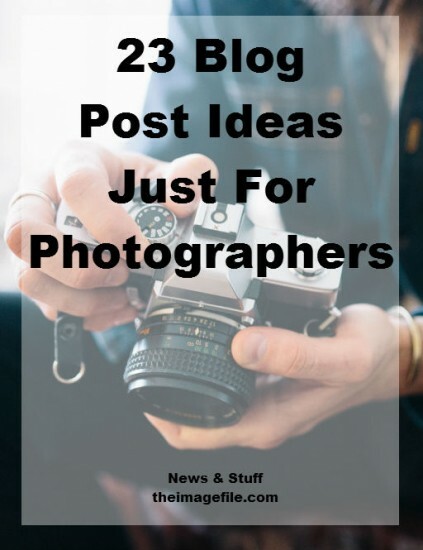 23 Blog Post Ideas Just For Photographers! As mentioned in a our blog goals for 2016 post, great content is king. However, regardless of how long you’ve been blogging, sometimes it’s just hard to think of something to write about. So I’m coming to the rescue with twenty-three blog post ideas just for photographers. The general public love getting sneak peeks of anything and everything. Consider sharing images of what your office or studio looks like, photos of projects ‘in the works’ and rough drafts. Take a look at Trudi Scrumptious’ blog to see photos of her newly revamped studio for a great example. Blog readers love to find out how you do what you do, so highlight each step of your process. This could be a guide through a project you’re currently working on or a walk-through of how you conduct a photo shoot. Everyone loves a good success story so why not share your experience and tell your readers how you got to where you are today. If you need some extra inspiration take a look at any of our Focus On interviews. Which resources have helped you get to where you are today? Was there any advice that inspired you? A great example is our interview with Annie Armitage who has gained success from many different aspects of the photographic industry. There may be some things that are happening or that are popular within your industry that you want to do differently. This doesn’t mean that you should promote negativity, complain, rant or be rude about anyone with a different point of view, but why not share a different side of the issue. Share an inside look to what your average work day looks like. You could even include some Instagram shots to jazz it up. You could write about what’s in your camera bag, the editing software you use and any organisation or productivity apps you use on a regular basis. There’s always something new to learn, but unfortunately we don’t have enough time to learn it all ourselves. So why not share your thoughts and insights on a recent experience, event or workshop you’ve attended? A great example is Trudi Scrumptious. She highlights her new product listings, baby clothes and props for photo shoots as well as upcoming offers. People are always on the lookout for helpful products and tools, and there’s nothing better than hearing a real opinion from a real person. This could be reviewing your camera equipment, editing software or prints quality. If you’ve been blogging for a few years then chances are you have some great content buried deep in your archives. Don’t let it got to waste. Share them again by doing a round up. An example of this is our Christmas Round Up. Similar to the point above, take your old blog posts and add something new to them. Maybe write a sequel? Do you have an old post that can be revamped or reused? Give it a bit of a makeover by writing an updated version or adding in some new photos. Could you link to any other past posts? A lot of business nowadays is found through various avenues of social media. Photographer Peter Barlow is a great example of getting most of his work through Facebook. Whatever business you’re in, there are always FAQ’s. These are blog posts waiting to be written. Maybe you’re constantly asked about your non-refundable booking deposit? Or perhaps a common inquiry is how you manage a wedding day as a photographer? Write about it! This could be how brides can make the photography process as simple as possible or how to be the perfect second shooter. This is a great blog post if you specialise in multiple areas of photography as you can tell one couple/family’s story. For example, you could display a couple’s engagement shoot, wedding images and newborn images. You may have read our WordPress series that was published back in October. Try to come up with a creative way of highlighting your services and products. This could take the shape of multiple blog posts as mentioned in a previous post. For more inspiration, take a look at our interview with Fiona Elizabeth. She clearly lays out all her services and products and is a great example of making everything clear to her clients. I understand that for many people the idea of sharing their trade secrets is a frightening thought. What if you create competition for yourself? However for many sharing a few secrets has had the opposite effect. If you do what you do well, then sharing information shouldn’t be something to worry about. We all have misconceptions about other industries. Why not de-bunk some of those myths and misconceptions with a blog post that puts the record straight? Maybe you’ve always admired a particular photographer or artist? Or perhaps a particular aspect of someone’s wedding inspired the feel of that atmosphere? Tell you readers! Neil Hemsley explained where he drew inspiration for his digital images in our Focus On interview. If a potential client is reading your blog, they want to see the type of work you produce. There is no better way of showing off your portfolio than through your blog. Hopefully these ideas will inspire some blog post ideas for you. Which ideas are you going to try? Do you have any other suggestions for blog posts? October Round Up! 4 Blogging Goals For 2016!